Painful Blessing- shared story | Why is This Happening? March 27th, 2008 was a wonderful day. Our kids were enjoying the lazy, sleep-in days of Spring Break. My husband Gordon had turned 51 the day before and had just closed a big deal in his consulting practice. We talked excitedly about a short vacation that was coming up. It was a beautiful moment in time that was about to take a dramatic turn. It was 3 am when Gordon woke me up and calmly asked if we could talk. Instantly, my mind began racing towards all the things that my husband of 18 years might feel the need to say at three in the morning: I had an affair, I want to move, I’m not happy, I want to go to cowboy camp... Seriously, who wakes another person up at 3 am just to talk?? He told me that he couldn’t see out of his left eye. I shot out of bed like the mattress was on fire. I called our eye doctor who said we should go to the ER “just in case.” We let the kids sleep—no reason to disturb them—and we got in the car. Other than the problem with Gordon’s left eye, he seemed completely fine. It had started to rain, so once we parked the car we even jogged into the hospital. We talked about how much this ER visit was going to cost since we carried only major medical health insurance. I looked at my watch, hoping we could get home before the kids woke up. Gordon’s brain scan showed nothing abnormal. The ER doctor concluded that Gordon probably had a detached retina and that he would have to go to the ophthalmologist in the morning. That didn’t seem so bad. We jogged through the rain back to the car. It was 6 am. I crawled back into bed, relieved that Gordon was okay, and a little stressed that we likely had just burned through about $5 grand with that ER visit. Gordon went to the bathroom before coming back to bed. I tried to relax, assuming the worst was over when I heard a thump. I figured it was nothing, just Gordon bumping the glass shower door with his elbow. Then there was a second thump: a loud, resounding thud like someone dropped a sack of potatoes, like a body hit the floor. Then silence. I threw off the covers and ran to the bathroom door. I knocked and called his name, but there was no answer. I opened the door and saw him collapsed in the corner. It was 6:30 am. The emergency service team arrived in minutes. It took three men to pull Gordon out of the bathroom and carry him to the bed. I explained to them what happened earlier and how we had just gotten back from the hospital where the doctor hadn’t found anything wrong. Obviously, something was terribly wrong. At a different hospital, the neurosurgeon said Gordon had suffered a bilateral carotid artery dissection resulting in a massive stroke. The best course of action was to try a clot retrieval. He was very clear that the outcome of the surgery was unknown. What does that mean? I discovered exactly what that phrase meant when the organ donation lady showed up. What do I pray for in this situation? Let Gordon survive? What if he survives but is in the vegetative state that the blonde woman in the white lab coat hinted at? Let Gordon die? I could never pray that prayer! Let him be a miracle person that suddenly pops out of bed, totally fine? Get a hold of yourself! I prayed that the good Lord would love Gordon and hold him in His hands. We would just have to trust Him to do what was best. Gordon survived, but not without severe consequences. The stroke took away the use of the entire right side of his body, his ability to speak, organize his thoughts, and his memory. In a moment, our lives were forever changed. We are now seven years’ post-stroke. We still work on recovery and accept that it will be a lifetime endeavor. We have exceeded all recovery expectations but still have more to go. We have become inspirational speakers, telling our story and encouraging audiences to face their challenges with love and faith. 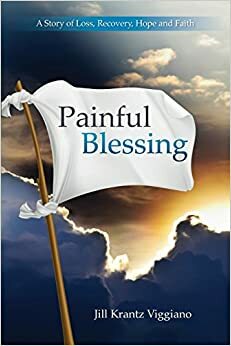 I wrote, “Painful Blessing,” a book about my experience as the wife/caregiver/mother. Why did this happen to us? Here is my answer: God loves us too much to allow us to be mediocre believers. By allowing us to experience this pain and loss, we learned what real commitment is, what real love is, and most importantly, what it is to put God first. By taking away the clutter and busyness of life, our priorities became clear. All that is left is what matters most. With every step, our faithful God has held us in His hands and through miraculous ways He has provided for all our needs. Gordon’s is a story of recovery; mine is a story of surrender. Surrender meant letting go of the past and being open to receiving what God has for us now. Surrendering has meant thanking God for carrying us through the rough patches and allowing us to be a blessing to others in ways we had never dreamed of before the stroke. He loves us and cares for us and asks us to trust Him. By surrendering, I have learned to do just that. I ask Him to show me the door of His choosing, and I promise to walk gladly through it.